Of all the things which sustain us, our breath is one of the most vital. We can go several days without food and water, yet the world record for absolute longest breath hold is 22 minutes. This is an almost unbelievable time (by a world champion free diver) – but the difference between a few minutes and a few days is vast – and a clear indication of the importance of the breath. Everyone knows breathing is important though, so I am stating the bleeding obvious really. What isn’t always a clear cut though, is the quality of both the air we breathe and more so, the technique and practice of breathing itself. In a similar way that shovelling down pesticide and steroid ridden food is eating – but not to optimal capacity – shallow and mindless breathing, often of toxin ridden air, is also not ideal! Even the most deluded person with terrible eating habits is well aware that it is not doing them any favours, but I wonder if the vast majority of people even ponder the depth and quality of their breathing – and likewise, realise how some simple adjustments and practices could improve their health and quality of life. There are a plethora of breathing practices and I’m not going to summarise or explore them here – except to say that obviously the yogic practice of pranayama – is probably one of the most widely known. Qigong and tai chi breathing is generally a little different and in the styles that I teach, promote deep diaphragmatic breathing where the belly rises as you breathe in, through the nose, and during the practice of these exercises, the out breath is via the mouth. 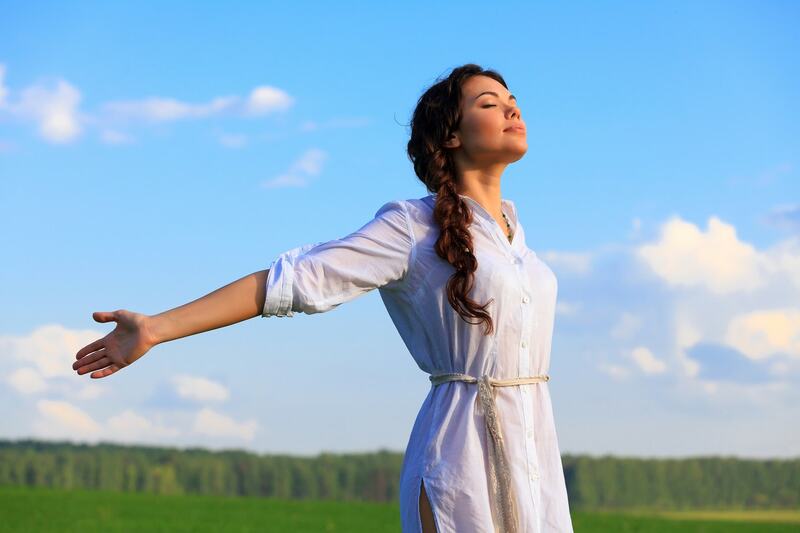 The benefits you will glean from mindfully breathing are immense. They range from transporting vibrant qi through the entire body, to lowering blood pressure, improving lung health, increasing energy levels, detoxifying the body, relieving pain and many even believe it will increase the span of your lifetime. One area that particularly interests me is in reducing the ‘fight or flight’ stress response, which is an amazing evolutionary trait, triggering an increased alertness and (hopefully) an ability to escape a highly stressful situation. Among other physiological processes happening during this process, the stress hormone – cortisol – rises. This is useful in situations where we need a heightened sense of awareness to avoid or escape a potentially life threatening situation. However, we face many situations which cause us stress and throughout the day our cortisol levels can remain high. This in itself will cause health issues including weight gain, lowering immune system, high blood pressure, insomnia and many other undesirable effects! Nature moves in cycles – and our hormonal balance is no different. Our levels are high in the morning and should naturally tail off as the day progresses. Whilst it offers an important response should we face a real danger by directing our internal resources to fight and survive, or escape. In reality, we don’t face that many – if any – life threatening situations in our day to day existence. The problem lies in our lifestyles causing our stress hormone to remain artificially high throughout the day, and even in to the evening. From the get go, with caffeine laden drinks, sugary breakfasts, the struggle to get seats on the ever running late trains or the busy school run and the nearly late fast drive in to work – all conspire against us, while we remain in a perpetually stressed out state. And this is before we even start work – the emails, the annoying bosses, gossiping colleagues, checking who has been writing things we disagree with on social media….. We then do it all in reverse on the way home before settling down with our (sometimes argumentative) families for dinner, followed by watching the Fear Broadcast (aka the news on the television) and then finally some Netflix film or TV show, to unwind as we watch a zombie apocalypse unfold, reality stars doing whatever it is they do, or something else containing mindless violence and panic. I know I am painting a negative picture and writing in extremely general and possibly stereotypical ways but I believe that unless you have an awareness of what’s happening, as well as a daily practice to reduce these artificial stress levels, that you are setting yourself up for future problems. Now there are a million and one ways to escape this rat race and the daily stresses that we are under. Whether your thing is physical exercise, meditation, yoga, tai chi, martial arts, walking the dog, reading… they are all great… and extremely valuable pastimes – but I think that by far the easiest one, which can be done absolutely anywhere – and anytime – is controlling your breath. Personally I do this several times per day – and I really feel that I need to do it this often – to get me through the day stress free sometimes!! It’s all well and good doing your tai chi/yoga/meditation/running…. or whatever… for an hour in the morning, and then on the way to work someone cuts you up and BOOM, there go the cortisol levels again! Adding regular breathing exercises, whether you are at home, in the car, on the train, at your desk, making a coffee, walking on your lunch break, can have have a hugely profound effect on your mood, your day and even your life. All you need to do is straighten your back slightly and without forcing the breath, just breathe in through the nose whilst allowing the chest to rise a little, and the stomach to expand. As you breathe out, open the mouth, let the breath leave the body through the mouth and the stomach to deflate slightly and the chest to sink a little (but not too much so that you hunch the shoulders). During any stressful situation during the day just try this exercise three times and you’ll notice a profound difference. It can equally be done standing as well as from a seated position. If you’re in bed or laying on a sofa, or the floor, you can also perform it there. As regular readers of my blog posts know by now, I’m a great believer in integrating your training and exercise into your daily life and there is no better – or easier – method than this. If you like a visualisation then you can imagine that as you breathe out, you are exhaling a dark cloud of smoke – anything negative – from your mouth with the breath. The inhalation is a golden light of positive energy, health and goodness, which will enrich and heal your body and spirit. What is happening here is that you are switching from using the sympathetic nervous system, used to bring the body into the flight or fight mode, to the parasympathetic nervous system – which will calm and relax you, bringing the breath, mind and body back into harmonious alignment. At White Crane Online we teach many breathing exercises through the practice of tai chi, meditation and qigong – you can follow our video courses for free as a Bronze subscriber or learn entire tai chi forms as a Silver or Gold level member. We are constantly renewing and updating the courses and will definitely be adding breathing exercises as well as meditations based on the breath. 0 responses on "Breathing for Life"